this is my first output in this challenge. There is a lot of good work around, here it is my first try, basic daylight through two windows. Some IES used on artificial lighting. If you have the time to help me with some tips it would be highly appreciated! Special thanks to Sapna Mondol for the modeling. First time participating in one of these challenges. I’m a beginner so give me as many pointers as you can muster! Please, of course. Haven’t added much texture-wise to the scene except the floor, and some of the geometry I forgot to render on smooth. Anyway, cheers! mrGamba: Welcome! There doesn’t seem to be enough difference in brightness between the natural light and the artificial light. The skylight should be much brighter than the artificial light unless it’s before dawn or dusk. I’f like to see some more separation between the skylight and artificial light. 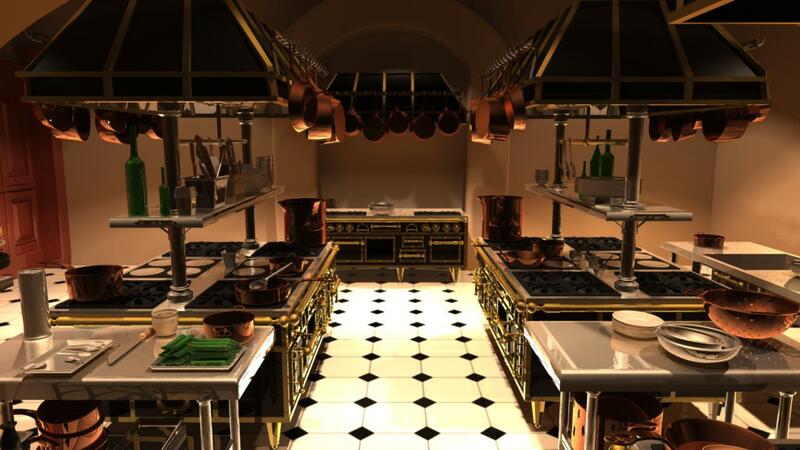 Maybe having the whole scene lit by skylight but one section is illuminated by an artificial light as a focus. Looks like some of the objects in the foreground could use some smoothing. Off to a good start! chapopote1988: Nice update. All my attention is being drawn to the bowls in the foreground. For one their near the middle, and it’s the only part of the scene lit with that color of light. I think you could simplify your color palette, there’s a bit too much going on. at2142: Welcome! Compositionally, the water coming out of the faucet is splitting the image in half. I’d recommend either moving the camera to the left or the right. The bright reflection on the faucet itself could be broken up horizontally by some darker areas. If you’re just using a white plane for the inside reflection, you could instead try to use a photograph. The vegetables in the bowl under the window could use some reflection of the sky through the window. Two of the spoons along the back wall are going very dark compared to the rest of the objects around it. Keep going! paprasabi2010: Welcome! Overall your scene is very dark yet, it seems to be lacking shadows. There also seems to be more light coming from the floor than there is from above. I’d recommend starting with one light with shadows that will be your key light and then build up bounce lights from there. Restrife: Nice update. The transition is much nicer between the color, good work. It still seems a little restricted and I’d like you to take it a little bit further even and have some of that warm light come all the way to the foreground and the cooler light in the background. Looking at your materials, the copper material could be blurred and tinted to look more like metal. One thought I had is that you could try extremely dimming the cool light in the foreground so that the background could be framed by darker sides. runejw: Getting better. The trim on the stoves seem to have some black artifacts, not sure what’s causing that. The floor is getting extremely bright in the middle and could be dimmed a bit. The tops of the counter and handles are also getting too bright and could be dimmed a bit. The wall underneath the counter in the background could be darkened quite a bit, some occlusion might take care of that. The glass bottles could have less diffuse as well as transparency, they’re getting a little too bright. AndiClockWise: Looking great! The bricks on the wall could be scaled up to be closer to the size of the average brick size. The sky outside is looking too dark, especially for the time of day. The objects on the right side of the image could use some kick from the bouncing sunlight but this might be taken care of once you put in some more materials. Looking forward to more! ayomc: Nice update. The copper could use a lot more saturation to it’s reflection, same goes for the brass. The metals in the scene could definitely use more highlights from the light sources. Jeloh: Glad to see an update. I feel like you lost a lot of the nice color and atmosphere you had. Did you add in some fog? It takes a lot of the contrast out of the scene. A little fog would work well but it would have to be pretty subtle. You’re right about the green highlight, maybe just turning down the intensity would draw less attention to it. Yes, actually not artifacts but reflections of the floor pattern - but agree, certainly distracting. Thanks for the feedback. Please click on bellow link for update. runejw: Oh yes, that makes sense. Maybe some reflection blur, so it’s not as crisp and would be less distracting. Links not working for me. This sound like an awesome challange, busy downloading the file and will start on it today! Is this more of a Lighting and Texture challenge, or just lighting? The light and the textures (color) go hand by hand. All the object reflact the light of diferent modes, depending of the material and color. My english is very bad, so i make a simple image to show you. The light and the camera is the same in the six images, only change de color of the walls and the torus. As you can see, all the light change by a simple color, so IMO a light challenge cant be without a texture and material challenge. Edit: in a pixar render style, the color contribution from the objects by the light bounces is very very important. I guess I didn’t really explain my question, but it doesn’t really matter now. For fun I just wanted to try a GI rendering as well and changed the lights in the chimneys to be point lights. 8 in each positioned inside the light fixtures and put transparency etc on those. Ceiling lamps done as spotlights. 2h 56 min at 900x600 on good quality settings. It’s amazing to see the quality of the work to be posting gradually; inspires us to improve our work every day. 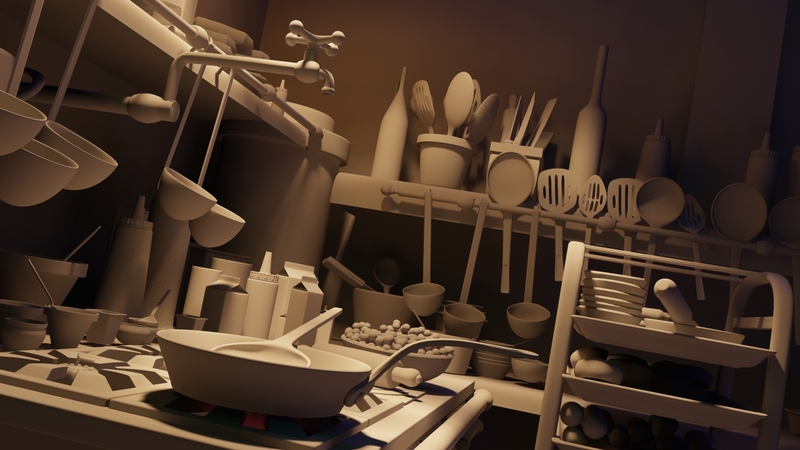 This is a new breakthrough in my enlightenment, I try to give a feeling of a small room, the kitchen of a restaurant modest, middle class, a cozy, lighting the’m doing with area lights, using the main light in a IES, trying to incandescent light tone and a light filling with a little night light. Any input or criticism to help me to improve and achieve my goal, I would appreciate it, to infinity and beyond … XD! been working on this mostly on the shaders using mia materials all around, simple light setup with area lights, and for indirect irradiance particles. I think ill watch the movie to get some inspiration from there and ill come back to this. asinn: Nice work! The sunlight could be warmer colored and brighter as well. Don’t forget to smooth the round geometry. Looking forward to some materials so you can get into some reflections and highlights. Hello this is the first time i am participating here. but having trouble with the file. GI on light attributes is not activating even though GI is on from render settings. please tell me how i can activate and alter the values of Photons ?